EPDM rubber surfaces are commonly chosen for sports facilities as they provide excellent ball bounce and slip resistant qualities, polymeric ball court construction is done at many schools and clubs in the UK. The specification of polymeric surfacing comes in a range of designs depending on how the facility will be used, these include full EPDM, structural spray application and a sandwich system. Each of these surface types can be installed to meet different requirements for multi use games areas and athletics track flooring with a range of uses. During a project we completed recently, the client asked us to install a multi use games area in polymeric rubber surfacing to an old and worn out facility. The existing sports court was surfaced in a synthetic turf carpet which had become extremely damaged and contaminated due to a lack of appropriate maintenance. This meant that the court flooring was flooded, covered in moss and unsuitable for use. A complete resurface was the only way to give the client a good quality sports facility that would be durable and long lasting for a range of activities. Our specialist installers began the process by removing the contaminated synthetic grass and excavating the area to the required depth. We could then install a dynamic stone sub base to give a stable and long lasting foundation to the sports court. This type of porous sub base is commonly used for sports pitches as it’s extremely durable. It is made using angular stones which fit together to give strength but to also allow water to drain through the layers quickly. Once the stones were compacted and stable, an application of macadam was laid out on top to give a smooth base layer which adds more stability to the surface. This was then left to cure and set properly before our installers continued with the work. 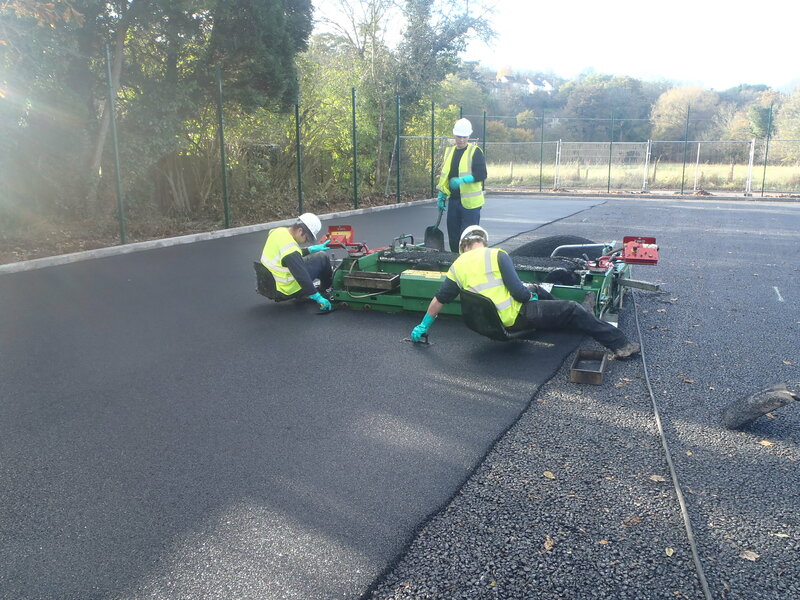 The next stage of the polymeric ball court construction was to install the EPDM rubber surfacing on top of the macadam base. This was done using specialist machinery which evenly lays out the mixture of polymeric rubber crumb and binder. Our specialist installers then smoothed the mixture out by hand to ensure a seamless finish to the ball court. After the entire sports court area had been surfaced with the polymeric EPDM rubber mixture, the flooring was left to cure and dry completely prior to the next stage of work. For any recreational or professional sports surface, it’s important to have a good looking court which people enjoy playing on. With this project the client chose to have coloured paint coatings and line markings for the different sports they wanted to play. The installers first applied an anti slip coating to the whole are in dark green to enhance playability and give the surface improved grip as well as a coloured design. 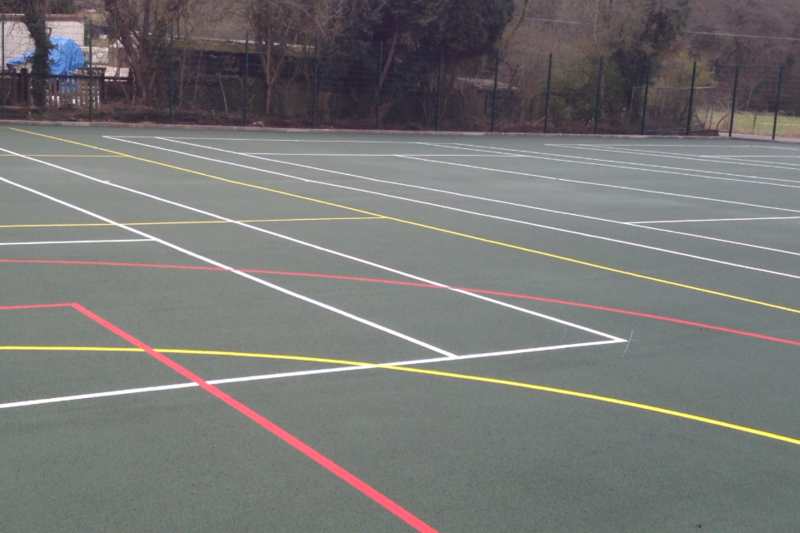 Professional line markings were then added in white for tennis, pink for basketball and yellow for football. Finally, the last part of the polymeric ball court construction was installing specialist rebound fencing around the perimeter of the facility. This was to replace the existing chain link fencing which had become unsafe and was falling apart. The new fence system is made of reinforced steel and will keep the area secure both during use and when the facility is not being used. Many schools and clubs have this type of professional sports fencing installed to prevent vandalism and also to stop equipment like balls getting lost and going out of the area. As experienced sports court contractors we can offer various designs and specifications for fencing to suit a range of budgets and cost requirements. Throughout the UK, polymeric rubber surfacing is used for sports facilities as it provides durable, slip resistant qualities for a range of sports such as basketball, tennis and netball. We are specialist contractors with various completed projects at schools, colleges, leisure centres and domestic sports courts. Our professional team will be able to advise you on the best specifications and surface designs for your polymeric rubber ball court facility. We can help you to keep costs down so you can stick within a certain budget, or create a bespoke design which suits team or club colours for the sports you want to play. Please use the contact form on this page if you have any questions with regards to polymeric ball court construction or any of the other services we provide for this type of facility. Our installers can also carry out proactive maintenance to keep the court surfacing in top condition, as well as reactive repairs to fix any damage to your court. 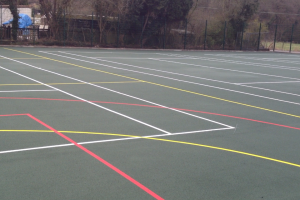 Costs, quotes and designs can all be discussed for any enquiry you have so don’t hesitate to send us your details and we’ll get back to you with more information on polymeric ball court construction.